The train project is an ongoing body of speculative investigation into the language and aesthetics of transport culture by artists HeHe. They propose personal rail travel as a temporary, imaginary solution to question our industrialised conscience in relation to locomotion. The notion of personalised rail travel has been explored as an alternative to collective transportation since the 1930s. The failure of this dream of a utopian infrastructure is reflected in Bruno Latour’s book Aramis or the Love of Technology, which describes France’s ambitious attempt to develop a personal rapid transit system. 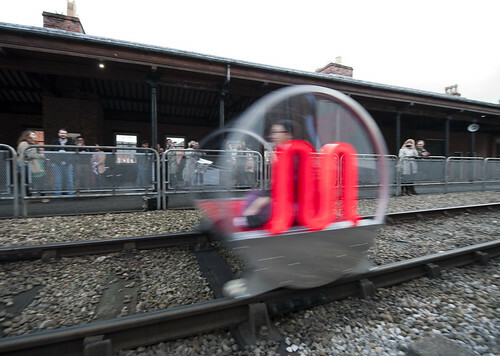 Operating during AND 2012 on some of world’s oldest surviving railway within the grounds of the Museum of Science and Industry, the M:Blem vehicle recreated a personal transport experience that was the antithesis of high speed travel. It was inspired by AB Clayton’s painting of the inaugural journey of the Liverpool & Manchester Railway in 1830. In their participatory piece, HeHe invited audience members to travel in M:Blem, journeying through space and time to experience the past and future of local transportation networks. Starting from the original station building of the Manchester to Liverpool line, the lightweight, autonomous rail vehicle references the carriages of Clayton’s painting and the cultural iconography of Transport for Greater Manchester. M:Blem was co-commissioned by Abandon Normal Devices and The Arts Catalyst, in partnership with The Region Ile de France. M:blem: the train project at AND Festival 2012 from HeHe on Vimeo.